What I’m about to say may come across as blasphemy, but I’m going to say it anyway. 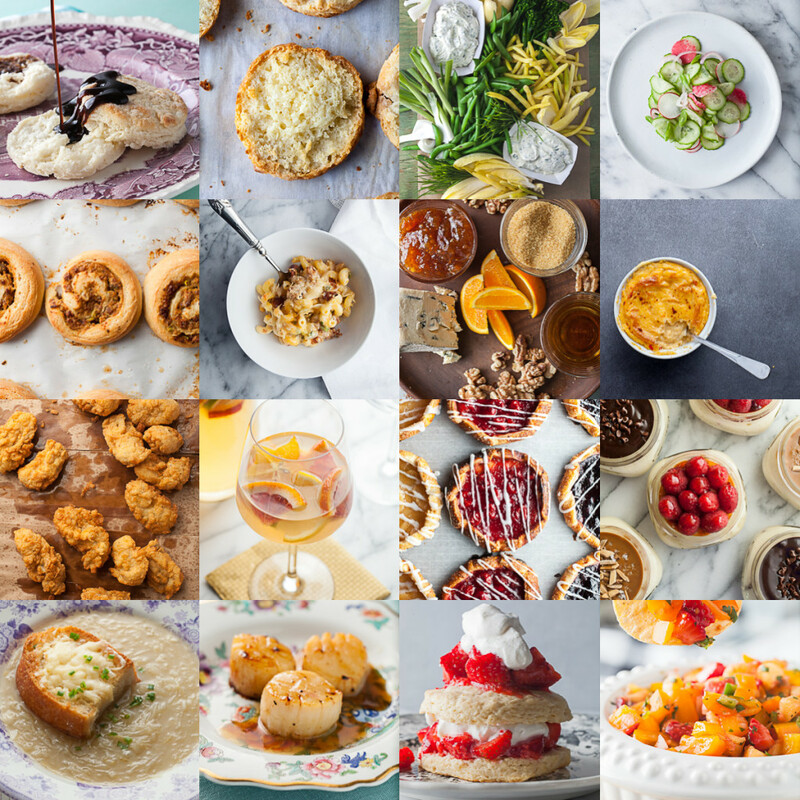 Artificial light is better for food photography than natural light. Well this isn’t the case. The “one light natural look” is best for food photography and I think that artificial lighting is the better choice for this look and some pictures to show you what you can do with artificial light. Artificial light can be created at any time. It doesn’t matter if it is noon or midnight, with artificial light you have the ability to shoot at any time of day. With daylight this isn’t the case. When the sun sets that’s it. You will have to wait until it the next day to shoot. Artificial light is incredibly consistent. 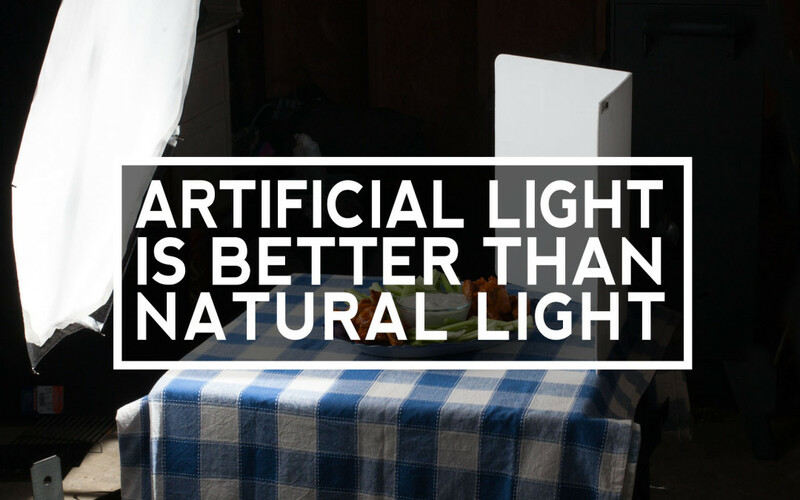 From the first shot to the last shot of a shoot, artificial light will give you the same look. With natural light, the look of your shots will change as the sun moves across the sky. That’s not all. Your look will also change as clouds move in front of the sun. If there is a certain time frame when the light looks best and you miss it, too bad. You’ll have to wait until tomorrow to try again. Artificial light can be created anywhere. This one is pretty simple to explain. When shooting with artificial light, the room doesn’t need to have a window. With daylight, you will need to have a window. If you don’t have a window, too bad. To be fair, there are two things that natural light has over artificial light. First, daylight is completely free. I can’t argue that. Free is a pretty good price. Second, natural light requires minimum set-up time. Again I can’t argue against the fact that it does take longer to set up artificial lighting, but the set-up time is really only a few minutes, so this is barely a point that I’m giving to natural light. So natural light is free and you can begin to shoot faster with it. In my experience these two “wins” for natural light aren’t valuable enough to out weigh the advantages you get with artificial light. You have a food/nutrition/healthy living blog and the only time of day that you have to shoot is in the evening once you’re home from your day job or the kids are in bed. You’re either racing to catch the last few rays of daylight or it’s too dark for you to shoot. This leaves you relegated to doing all of your shooting on the weekend when there is natural light available. You have to go shoot a dish at a restaurant. This could be for a client, editorial publication, your blog, or you own the restaurant and want to capture images of your food to share on social media. You arrive at the restaurant and there are no windows near tables or convenient to shoot at. It is full of tungsten “mood” lighting that looks great on people, but is horrific on food. If you only rely on your natural lighting skills you are out of luck. You move to a new house/apartment and the amazing window that you used to use is no longer there. This new place has natural light, but it it just doesn’t look as good as your old place. The solution to all these problems is to have some way to create amazing light wherever you are! When shooting with artificial light, I have the confidence in knowing that I can get a consistent look anytime and anywhere that I want to shoot, and I can’t express enough how HUGE a relief that is. So have I convinced you that artificial is better than natural light? If not that’s okay. I hope that I have at least shown you why you need to have the capability to shoot with artificial lighting. 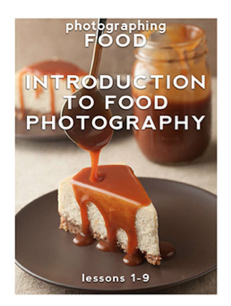 If you’re ready to get started with creating an artificial lighting solution that is right for you, check out the photographing FOOD PDF series. Issues 1, 3, and 8 are dedicated specifically to the concepts that you need to master artificial lighting. I love your site. It is very informative! I have learn alot and I am planning to buy your book series soon!